Combine chicken and 2 tablespoons soy sauce in a resealable plastic bag; seal and gently shake until well coated. Refrigerate at least 2 hours or overnight. Heat a grill pan to a medium high heat. 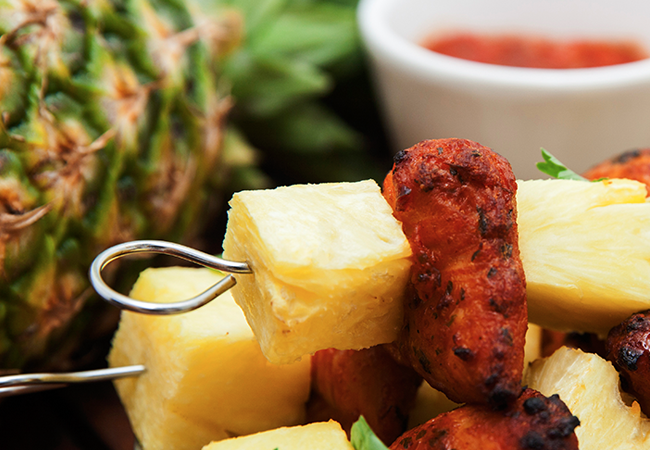 Thread the pineapple, chicken and vegetables alternately onto skewers then place them on the grill pan, turning every four minutes until chicken is cooked throughout. Pour lime juice, sugar and ginger into a large saucepan and boil over high heat until reduced. Remove sauce from heat. Serve the skewers with brown rice, pour the sauce over the dish and enjoy!